Fourth Row Center: Film Writings by Jason Bailey: #NYFF Review: "Paradise Lost 3: Purgatory"
The first quarter of Berlinger and Sinofsky’s new film is primarily background and catch-up, helpful for filling in viewers new to the story and refreshing those who saw its HBO documentary predecessors, Paradise Lost (1996) and Paradise Lost 2: Revelations (2000). The filmmakers then move on to the birth and growth of the movement that followed, with thousands of online supporters and outspoken celebrities joining in the fight to overturn the convictions of the three young men—a fight thwarted at every turn by the state of Arkansas, particularly Judge David Burnett, who not only presided over the original trial, but every single motion and appeal. The primary focus of Paradise Lost 3 is the events of the past four years, in which new evidence came to light that not only seemed to prove the WM3’s innocence, but pointed the finger to another feasible suspect. Intermingling footage from the first two films (shot between 1993 and 2000) with new material, Berlinger and Sinofsky (and editor Alyse Ardell Spiegel) move nimbly through the years—they know this material inside out, having lived with it for nearly two decades. The frequency and repetition of the on-screen text may irritate some, but it’s necessary; the story is such a mass of names, relationships, and dates, popping across such a wide-ranging chronology, that the supers help even plugged-in audiences keep everything and everyone straight. Perhaps the most peculiar and problematic figure of the first two films was John Mark Byers, stepfather of one of the victims, who often seemed to be reading from a prepared script in his fire-and-brimstone damnations of the trio. Convincing theories were floated, mostly in the second film, that he might have been the true culprit. 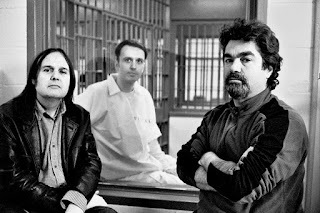 When the DNA evidence is finally released, basically clearing the West Memphis Three (and, not incidentally, Mr. Byers), he does an astonishing about-face and comes to not only believe in their innocence, but to crusade loudly for their release. (Shockingly enough, it is his voice that we find ourselves agreeing with during the film’s epilogue.) His is a character arc that might be tough to swallow in a fiction film, but it infuses this one with genuine, unexpected pathos. The legal and investigative angles, meanwhile, are expectedly dense and startling, from bombshell information about the misconduct of the original trial’s jury foreman to riveting footage from the deposition of Terry Hobbs, the new object of suspicion in the case. But as with the previous films, it is the human angle that sears itself into our memory—that of the grieving parents of the three murdered boys, and the families and friends of the three young men who lost years of their own lives due to what amounted to a witch hunt. There are real emotional moments here, like Byers reading the letter Echols sent him after his conversion, or the embrace between Echols and Baldwin at their closing news conference. Those scenes are why this story became the sensation it did: because Berlinger and Sinofsky never treated their subjects like a cause or an abstract. They were real people, all of them, the victims and the accused, and they were all suffering. In Paradise Lost 3: Purgatory, we are given some comfort by the knowledge that some of that suffering is over, while the tasteful dedication after the fade to black reminds us that some of it will never end. "Paradise Lost 3: Purgatory" screens 10/10 and 10/11 at the New York Film Festival.